With Labor Day approaching, we at Biowars thought it would be a great time to highlight some of the more ordinary career choices comic book superheroes have taken on throughout history. That’s right, even some of the most well-known fictional characters have been consigned to clocking in at day jobs they might otherwise abandon if the role didn’t serve as a cover for their crusading ways. So without further ado, here are a few comic book icons whose day-to-day is not really all that different from your own. At some point in our lives, every one of us has worked for a hard-nosed boss like J. Jonah Jameson, who Peter Parker repeatedly disappoints as a photographer at the Daily Bugle. And though his photography skills are somewhat lackluster compared to others at the company, Parker is able to hold on to his position at the New York rag for one simple reason: he’s the only person who gets great pictures of Spider-Man – and as we all know, Spider-Man sells newspapers. Prior to becoming an irradiated and buffed out Smurf who sees the past, present and future simultaneously (along with treasure trove of other god-like qualities), Doctor Manhattan was known as Jon Osterman, nuclear physicist. Osterman’s transformation took place when he was disintegrated in an Intrinsic Field Subtractor and put himself back together, atom-by-atom, into what would become the only Watchmen character with true super powers. He then joined his next employer, the U.S. government, who used him as a nuclear deterrent during the Cold War. Stark Industries, Stark Enterprises, Stark Resilient – no matter what you call it, it’s one of the largest organizations on the face of the Earth, with Tony Stark as its sole heir and unbelievably effective CEO. 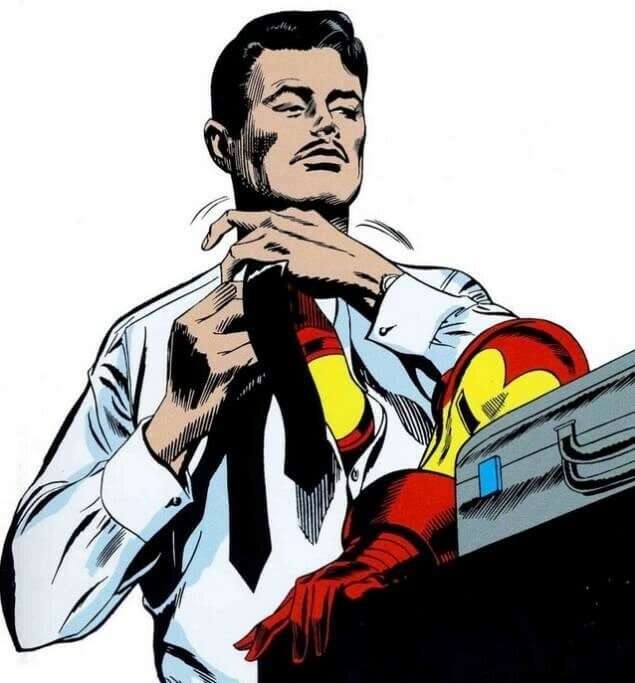 With facilities spanning 30 countries on every continent in the world, Stark took an already flourishing company started by his father well beyond its munitions focus and into the realm of science and robotics, which no doubt made it easier for him to build – and redevelop – his Iron Man suit when he got bored with business and chose the superhero lifestyle instead. When the new Wonder Woman movie comes out in 2017, the story will hopefully stray from the outdated gender role traditions of its comic book past, where Diana Prince served as a nurse in the United States Army so she could close in on Major Steve Trevor, who made this Amazonian woman’s heart go pitter-pat. But don’t worry, the job didn’t last long anyway, and neither did her stint afterward as a secretary, before she finally moved on to bigger and better things: like finally going full-time as the superhero we know as Wonder Woman. If you’re going to go the caped crusader route without any real super powers, you’d better be filthy rich, which is certainly the case for Bruce Wayne, owner of Wayne Industries. Like Tony Stark, Bruce Wayne took his inheritance and made it into something even more financially ginormous, then used company capital to fund his entrepreneurial endeavor of being Batman, with all the bells and whistles every Dark Knight deserves. But let’s face it, any one of us comic book lovers would have done exactly the same thing.